A pioneer in data availability segment, IBM boosts of a comprehensive data protection portfolio. New age data protection solution support backup and recovery of data across on-premise and cloud environment, including instant recovery of Virtual Machines. These solutions have capability to counter new age threats like, Ransomware attacks and detect any signs of unauthorized access. 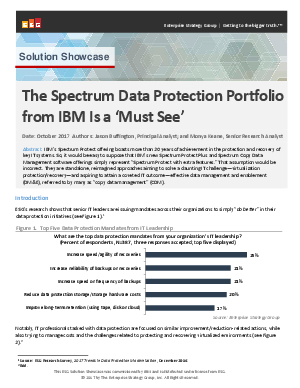 Read this whitepaper to learn how IBM Spectrum Protect portfolio stands apart from it’s competition.